I’ve just received a mini PC powered by AllWinner A31, and I had to (re-)install the firmware, so I’ll explain the steps I followed in this post. The procedure is for CS868 mini PC, but it should be similar for all Android HDMI TV dongles, and media players based on AllWinner A20 or A31.The procedure below only works in Windows, and has been tested in Windows XP. I’ll mention a possible method in Linux at the end of the post. Download PhoenixUSBPro tool in English, and extract This is optional as the Chinese version is included in rar file above. Click on Update to upgrade the tool to the latest version if need be. 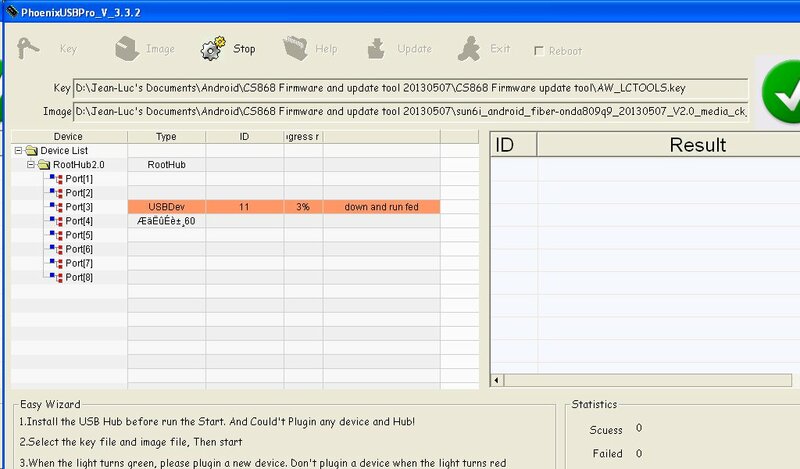 Click on Key to to load the key file (AW_LCTOOLS.key), on Image to load the firmware file (sun6i_android_fiber-onda809q9_20130507_V2.0_media_ck_288.img), and click on Start. Now connect the microUSB to USB cable to the OTG port of your device, use a paper clip or tweezers to press the recovery button, and connect the other end of the USB cable to your Windows PC. Release the recovery button once you hear Windows has detected a new device. 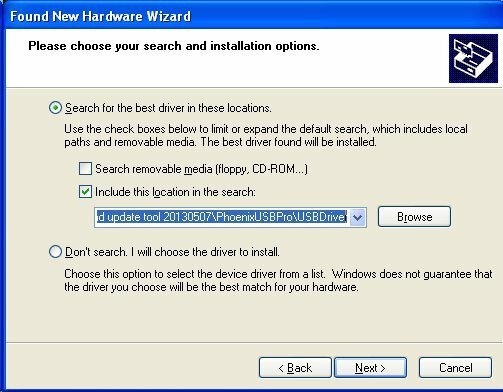 Do not let Windows search for a driver online, but instead set the search path to PhoenixUSBPro/USBDriver, as shown below. Click on Next, let the driver installation complete, and the firmware update should start. Wait a few minutes until the firmware upgrade completes. It took 3 minutes 38 seconds to upgrade my device. At the beginning I had issues in Windows, because, as I found out later, my Windows file system was encrypted, so I also gave it a try in Linux using Livesuit, but unsuccessfully. Livesuit Linux refuses to load the img file provided. The most likely reason is that Livesuit and PhoenixUSBPro file formats are different (and Livesuit did not need to key file), or the current version of Livesuit may only work with AllWinner A10 or Cubieboard. I’m sure somebody will correct me on that. It can not be flashed by Livesuite in Linux because their packing tool did not updated. Anyway, they don’t care about it. Have flashed my MK810 of the image mentioned above. Got this TV stick without working android from alibaba. The seller send me a indifferent Image (sun4i-crane-tvbox-t3s) which would not flashing with Phoenix. So will look what is the difference. On my CS868 all my programs keep corrupting and eventually fails to Boot up. I have to﻿ re-flash each time to get out of this problem. I cannot use it, Because it keeps getting corrupt. 2 days is the max i can use before i run into this problem ! Is it firmware ..or cheap internel sd card ? I’ve used CS868 for about 2 days, and I had to reflash the firmware twice. I’d say it’s definitely a firmware issue. Make sure you always use the power off button before you turn off the device, I think it may help mitigating the issue. hello. I bought a cs868 and arrived with problems in the operating system, I chose to update the syatem, but the tool phoenix does not work well on my computer, I have all the steps you said. but does not work, the phoenix always shows the red button with the X, Y also does not show the device list .. please help me. You may want to make sure your are log-in as an administrator. Which version of Windows are you using? My guess is that Windows 8 won’t work, but Win7/XP should be OK.
Hi. Maybe you can help me with my problem. I bought a noname Chinese SMART MEDIA PLAYER Mini PC resembling in appearance, features and technical details with this: http://www.ebay.com/itm/Dual-Core-Android-4-2-2-Smart-TV-Box-Pro-Media-Player-1080P-WIFI-HDMI-XBMC-YOUTU-/310953226142?_trksid=p2054897.l4275 . In one of the tests I’ve done I selected to display the last option. I do not know who it was (maybe you are kind and post a printscreen with sub display). Since then no longer see any HDMI or AV than the blackscreen. After booting enter blackscreen. Has a hole in the back where he is a reset button. I tried, by pressing all the variations. 5 seconds, 10 seconds, 30 seconds, until it starts ….. just managed to reset or get into recovery. Player have root by default. We could not do anything. Please help me.